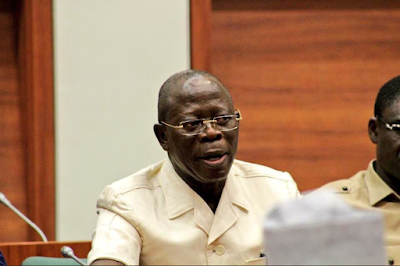 DSS Asks Buhari To Prosecute Oshiomhole Over Dollars? The department of State Services (DSS) has asked President Muhammadu Buhari to prosecute Adams Oshiomhole, National Chairman of the All Progressives Congress (APC) over monumental corruption in just four months in office. He allegedly received multi-million Dollars in bribes before and after the APC primaries all over the country. In October, SR had reported how Oshiomhole and his cronies received up to N50million in bribes to award last-minute tickets to undeserving members of the party. The DSS subsequently grilled Oshiomhole last week, with reports emerging that the former labour leader had been asked to quit the office. Oshiomhole responded by saying the DSS did not hire him, hence couldn’t demand his resignation from office. But SaharaReporters can now confirm that not only is the DSS asking for Oshiomhole’s removal from office, the agency is asking the presidency to prosecute him. SaharaReporters can also confirm that the figures mentioned earlier are nothing compared to what the DSS documented in a report it forwarded to the presidency and the Economic and Financial Crimes Commission (EFCC) some days ago. “Total $55 million is what Adams is alleged to have received. Some party chieftains claim it is $80 million,” a source aware of the contents of the report told SaharaReporters. According to report, $17 million is what Oshiomhole allegedly received as bribe from Zamfara: $10 million for him, $7 million shared between Farouk Adamu, former Minority Leader of the House of Representatives; Niyi Adebayo, former Governor of Ekiti State. He received from other party chieftains, too. It is unclear if Buhari will follow the recommendation of the DSS for Oshiomhole’s prosecution, as SaharaReporters understands there is pressure from Bola Tinubu, National Leader of the APC, and Vice President Yemi Osinbajo, to give the embattled National Chairman a soft landing.